Do you know the volleyball rules for serving? Executing the serve The volleyball serve must be executed by the player that is in the right back position. The server must release or toss the ball when executing a serve. The server is allowed only one toss or release of the ball. A toss only counts if the ball is tossed with the intention of service. I mention this because sometimes part of a players serving routine is to toss or bounce the ball a couple times before they serve. So if they arent tossing to serve the ball, they're ok as long as the allotted time hasn't yet expired. The server must release the ball when serving. The server cant hit the ball out of their hand (this is common with underhand serves). The ball must be released. Must not contact the court If in contact with the floor, the server must not step across or contact the service line until after contact with the ball has been made. If the server jumps when serving, the last contact with the floor must be behind the service line. The server can then land on or in front of the service line. Can't be in contact with the ground outside the service zone The server can't be in contact with the ground outside the service zone when making contact with the ball. After the contact, the server may step outside the service zone or into the court. The serve must be executed within the allowed time. USAV Rule The ball must be hit within 8 seconds of the referees whistle for serve. 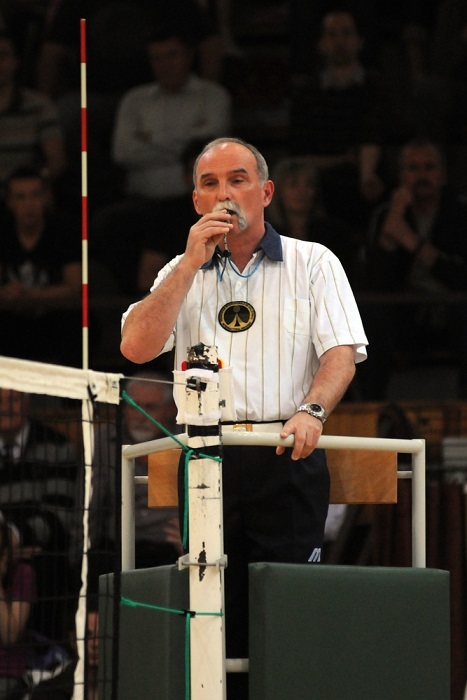 USAV Rule for 14 years and younger The ball must be hit within 5 seconds of the referees whistle for serve. Rules in volleyball limit player playing actions such as, 3 hits to a side, only the front row players can attack the ball when the ball is entirely above the top of the net, the player positioned in right back must execute the serve, etc. A player on a volleyball team can be designated as libero. The libero playing actions are much different from other volleyball player actions. For example, the libero can come in the game and take the place of any back row player on the court, but can't ever play across the front row. A team scores 25 points with a minimum 2 point lead. In the case of a 24-24 tie, play continues until a 2 point lead is taken. A match is won when a team wins 2 out of 3 sets. A playoff game is considered a match and only 1 set shall be played. Before the start of a match, the referee conducts a team captains meeting. The referee goes over any ground rules and conducts a coin toss. At the coin toss, the referee may go over the rules for game interruptions such as the procedures for substitutions and timeouts. All volleyball participants must know the rules of volleyball. Sanctions may be issued to players, coaches, or other team members for rude conduct or aggressive behavior. The playing area includes the volleyball court and the playable area that surrounds it. Volleyball Court Measurements Volleyball court dimensions are 18 by 9 meters or 59 feet by 29 feet 6 inches. Free Zone The free zone (playable area) should be a minimum of 3 meters or 9 feet 10 inches wide on all sides of the volleyball court. All lines on the court are 2 inches wide. Sidelines and Endlines The boundary lines are made up of 2 sidelines and 2 endlines. Both the sidelines and endlines are part of the dimensions of the volleyball court. Centerline The centerline extends underneath the net from sideline to sideline. The centerline is the line that divides the court into 2 equal halves. However, the entire centerline is considered part of each side of the court. Attack Line On each side of the court there is an attack line. The attack line extends from sideline to sideline and is placed 3 meters or 9 feet 10 inches from the centerline. Front Zone The front zone is the area between the centerline and attack line. The front zone extends beyond the sidelines until the end of the free zone. Service Zone The service zone is the area behind the endline that extends from sideline to sideline. The service zone is 9 meters or 29 feet 6 inches in width and in depth extends to the end of the free zone. Substitution Zone The substitution zone extends from both attack lines up to the scorers table. The volleyball net height is measured from the center of the net. The net height at the 2 sidelines must be exactly the same and cant be over 2 cm higher than the official volleyball net height. Kenda S. Lenberg. 2005-2006: USA Volleyball Domestic Competition Regulations. New rules in volleyball for the 2009 season. New rule changes for highschool and collegiate volleyball. New USAV and FIVB rules for 2009-2010. Beach volleyball rules for sand and grass doubles, triples, fours, sixes, coed, reverse coed, and FIVB outdoor competition. Volleyball rules high school quiz. Take the following high school volleyball rules quiz and see how well you know the rules.